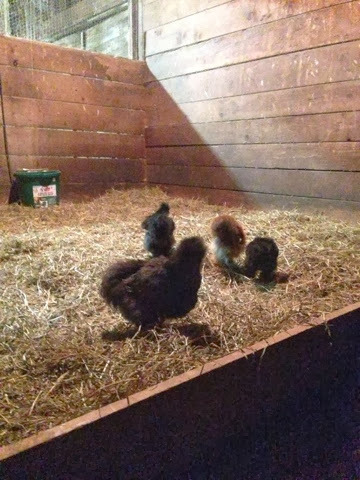 This past week the silkies were finally let out of quarantine. We knew that we shouldn't just throw them in with the other chickens, so we put them in a dog crate in the coop. While they have their own coop, we didn't think it was warm enough for winter and it still needed some reinforcements before they moved in, so the dog crate in the coop was the warmest option. The silkies became restless inside it so we would occasionally let them out in the sheep stall to peck around and stretch their wings. Then today, when the temperates dropped below freezing, all the chickens were stuck inside, and the silkies were pleading to be let out. I figured they would be fine since they had been seeing each other through the wire crate walls, but boy was I wrong. Almost instantly the big chickens chased all the silkies into a corner and started pecking at them and harassing them, not giving them a break for half a second. They were not only being mean, but they were doing it without being approached or provoked, so I knew I had to intervene. I felt bad the silkies couldn't peck around in the coop, so I had to find some new housing arrangements for the silkies. Just after putting the sheep out to free range, I closed the door and put the silkies in the sheep stall, so they could at least stretch their legs. I brought them a dog crate stuffed with straw as well as a waterer and a small bowl of feed hidden in the back of the crate, out of the reach of any hungry sheep that could come along. When I opened the door to leave the sheep stall, I found the sheep waiting. I let the sheep into the stall, and then put the silkies in their own little fenced area so they wouldn't be trampled by the sheep. At least the silkies will have this night to sleep in peace. We set up this little area for the silkies to stay in for now. 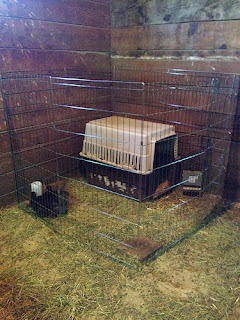 We put up the fence so the sheep wouldn't eat the silkies' food and so the silkies wouldn't drown in the water bucket. They seem happy with it, so we may just leave them there for the rest of the winter until they can move into their coop in the spring.